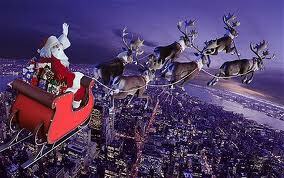 Join Sahib and the Crew in Operation Santa's Sleigh-Away! According to a Washington Post article anonymous Santas are paying off layaway items at K-Mart and other chain stores this Christmastime. Stores in Nebraska, Michigan, Montana, Iowa, Missouri, and Indiana are reporting people have been paying down toys and items for young children that their parents have placed on layaway. Devoted readers, we all can make a difference this year at Christmas no matter how small or how large a contribution you can make. According to Karl Graff the assistant K-Mart manager in Omaha, one woman broke into tears when he called her to tell her about the help. "She wasn't sure she was going to be able to pay off their layaway and was afraid their kids weren't going to have anything for Christmas." Graff said, "You know, 50 bucks may not sound like a lot, but I tell you what, at the right time, it may as well be million dollars for some people." Last week I saw first-hand how big an impact small efforts can make. A program in which I participate built and gave away 27 bicycles to local Boys and Girls Club programs. The looks in the children's eyes as they were wheeling their bikes to the bus was something I'll never forget. We have a week left before Christmas! If you can, go down to your local K-Mart, Wal-Mart, Target, or any other store that has a layaway program. Ask about layaway items that have toys or items for children and offer to pay down the layaway. One caveat, ask about the store policy before completely paying off items. You may want to pay it down to a couple of dollars so that it is not closed out. We can make a difference! Please help if you can and share this with your friends and family. Merry Christmas and Happy Holidays to you and yours from Sahib and the Crew! Thank you Sahib for promoting this.